EDD Bookings offers a few general settings that apply plugin-wide. The options for Timezone and Date Format, Time Format are inherited from your WordPress site's settings. Therefore, clicking on either of these options will open the WordPress settings in a new tab where you can change the settings to your preferred options. Change this setting to choose the day your week starts on. 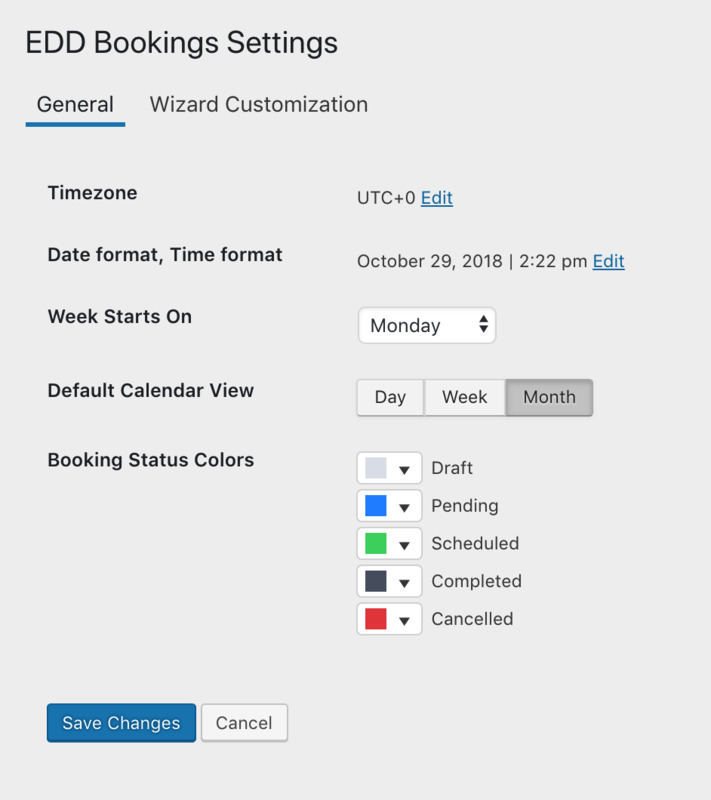 This will apply to all calendars used throughout the plugin, be it when setting up a service, managing your bookings, or on the custom-facing booking wizard. Similar to the option above, change this setting to choose the default calendar view between day, week and month. This will apply to all calendars used throughout the plugin. If a calendar does not have a "Day" option, it falls back to "Week". These are the colors applied to each booking status (Draft, Pending, Scheduled, Completed, Cancelled). These colors are used within the Calendar view of your Bookings to help distinguish between each booking.